Tiaras have always inspired a great fascination and the most beautiful and influential women have been painted, photographed and admired whilst wearing them. Even in the twenty-first century they are still worn and continue to inspire special poise, elegance and sophistication. This lavishly illustrated book includes exclusives photographs, many reproduced for the first time, of a variety of Royal tiaras together with those of French and Russian Imperial provenance, including four stunning tiaras designed by Prince Albert for Queen Victoria. Geoffrey Munn has also been granted privileged access to the archives of many famous Jewellers, including Boucheron, Cartier, Van Cleef, and Arpels and Fabergé, for his research. The regal images of some of the most prestigious jewels in the world will captivate the reader. Many of the tiaras have great historical significance and their provenance is explained here. Among the contemporary pieces referred to are tiaras belonging to Jamie Lee Curtis, Vivienne Westwood, Elton John, and Madonna, that were made by Galliano, Slim Barret and Versace. 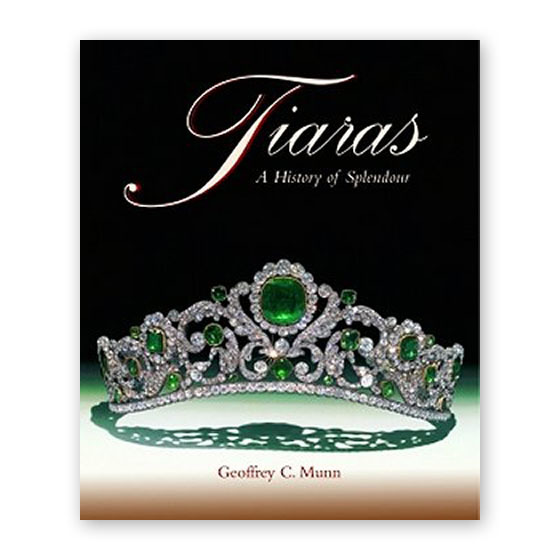 The scholarly text incorporating over four hundred illustrations, includes chapters on tiaras as crown jewels, Russian style tiaras, tiaras as works of art and the relationship between the tiara and costume ball. Tiaras, A History of Splendour is a magnificent work that will enthral all those interested in fashion and style, jewellery, European history and Royalty.